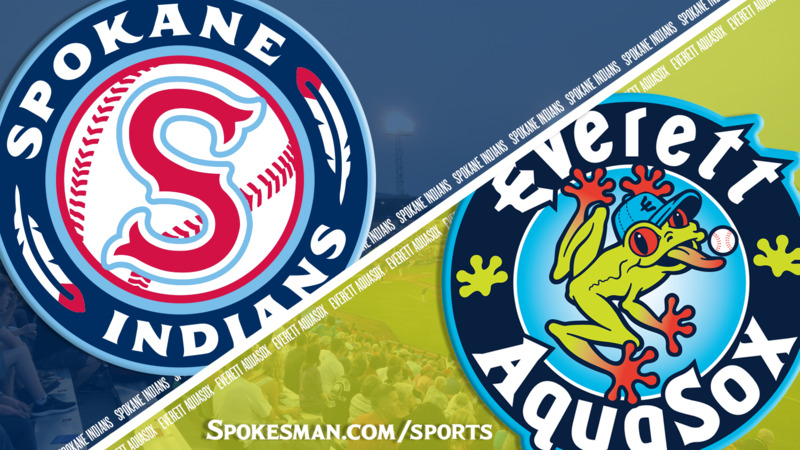 EVERETT – The Spokane Indians returned to their winning ways Tuesday night. J.P. Martinez finished 4 for 6, including a home run to lead off the game, and the Indians snapped a three-game losing streak with a 6-0 victory over the Everett AquaSox at Everett Memorial Stadium. Indians starter Seth Nordlin (4-1) worked seven innings, allowing five hits, striking out six and walking one. Spokane won for the first time since tying the Vancouver Canadians for first place in the Northwest League’s North Division second-half standings. With Vancouver (16-10) also winning on Tuesday, the Indians (14-12) trail by two games with 12 games left in the regular season. Everett is 11-14 in the second half but won the North’s first half to qualify for divisional playoffs. Spokane clinched the season series over the AquaSox, improving to 7-4 against Everett. Spokane reached Everett starter Carlos Hernandez (3-5) for two first-inning runs, the second coming when Jonah McReynolds was hit by a pitch with the bases loaded. Curtis Terry’s RBI single to center field in the fourth boosted the lead to 3-0. Scott Kapers doubled home a run in the sixth and scored on Jax Biggers’ triple to right for a 5-0 advantage. Kapers, who finished 3 for 5, also scored in the eighth when Diosbel Arias drew a bases-loaded walk. Despite the easy win, the Indians struck out 15 times. Spokane will return to Avista Stadium on Thursday to begin a five-game series against the Salem-Keizer Volcanoes. Published: Aug. 21, 2018, 10:04 p.m. Updated: Aug. 21, 2018, 10:15 p.m.